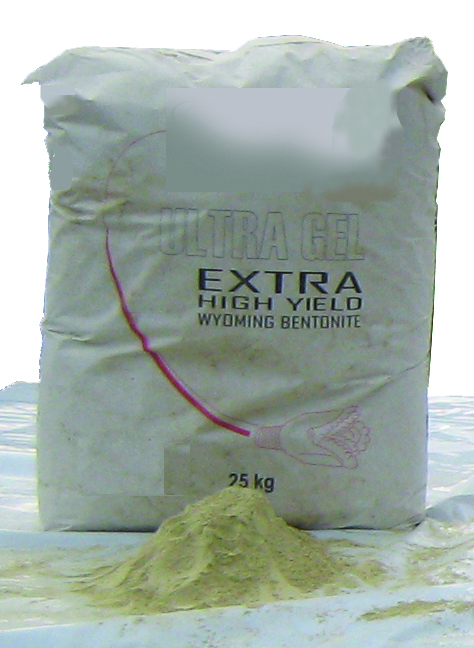 Ultra Gel is an ultra high yield, 200-mesh sodium bentonite clay with a special dry polymer additive. It is a product to be used in fluid assisted drilling and it is designed to maintain borehole integrity in drilled boreholes. Ultra Gel is specially recommended in sand and gravel (formations with high permeability and porosity) when they may have issues with hole cleaning (high gel strength required) and borehole stability (good tight filter cake needed). Ultra Gel is specially designed for conditions encountered in drilling. Maintains borehole integrity in horizontal and vertically drilled holes. Mixing ratios are based on the use of fresh water: water purity will affect bentonite performance. For best results, make-up water should be pre-treated with soda ash to a pH of 8.5-9.5. Ultra Gel should be added slowly through a jet/hopper mixer. 25Kg plastic bags, 40 bags per pallet. All pallets are plastic-wrapped.